Beginning today, a select group of Abra users and new customers will see the option to buy bitcoin with their American Express card. The months-long integration process between the two companies involved Abra exposing the depths of its business processes to its partner and investor, and has resulted in an even closer relationship between the firms. Still, Abra founder and CEO Bill Barhydt believes the end result of that effort could be a rapid acceleration of bitcoin adoption globally. This means users whose American Express purchase option is enabled today can now purchase up to $200 worth of bitcoin per day, and up to $1,000 of bitcoin per month for a 4 percent fee. Designed to cover Abra’s own costs, Barhydt said the startup doesn’t expect to generate any revenue from the fees, but will rather earn its share from managing the exchange rates between US dollars and bitcoin. American Express spokesperson Elizabeth Crosta clarified that while Abra’s customers are now able to fund their wallets with American Express Abra is not processing the transaction. But it’s perhaps the scale of what was needed to make this feature a reality that is most notable. In the weeks leading up to today’s launch, Abra employees, American Express staff and Abra investors have been testing the integration, Barhydt said. In spite of the tests though, the remaining Abra customers won’t receive permission to conduct American Express purchases until initial users safely complete purchases. Eligible cards include American Express US consumer cards, American Express-branded cards issued by third parties and American Express re-loadable prepaid cards, Bluebird and American Express Serve, which can be purchased at Walmart, CVS, Walgreens and more. “Anybody who shops at Walmart can walk into a Walmart store anywhere in the country, buy a Bluebird card at check-out, put all the money they need to on that card, register that card, and once the card arrives at their home, they can immediately load those funds into their Abra app,” Barhydt said. To pull off the months-long project, Barhydt said the two companies invested “significant” resources integrating on a technical level to ensure satisfactory security on both sides of the deal. In particular, Barhydt said his firm was asked to reveal how it works with exchange partners, as well as its know-your-customer process. 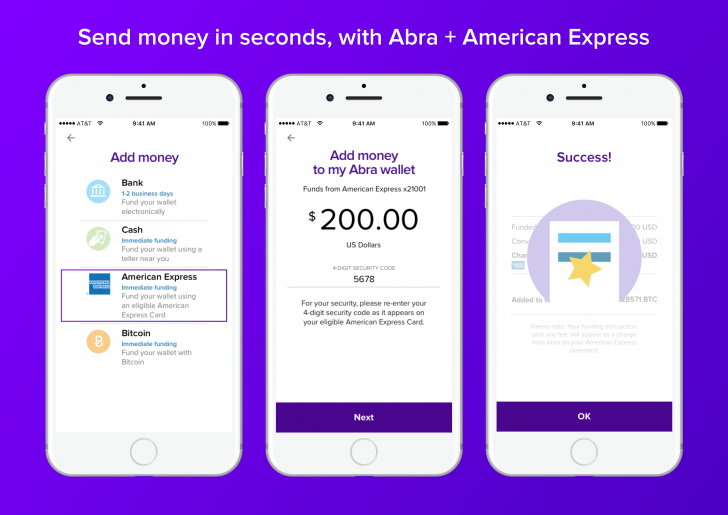 After raising $14m venture capital from American Express Ventures and others, Abra now lets its customer store funds in both bitcoin and fiat currency with support from banks including Bank of America, Capital One, and Chase, along with credit unions from Charles Schwab, Fidelity, and Wells Fargo. But Abra too had its own concerns about American Express’s KYC practices. As result, the “instant issue” capability of some reloadable cards has been disabled. Instead of being able to add cash to a card and spend it immediately, customers will have to have to go through extra steps to connect their identity to the funds. “You will have to register the card with American Express and wait for the fully registered card to arrive in the mail,” said Barhydt. Still, Barhydt believes the work is worth it. 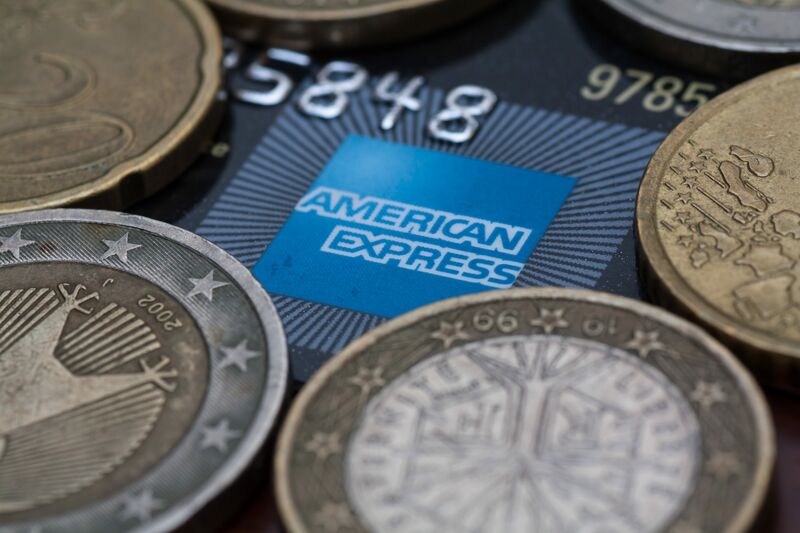 In interview, he cited American Express’s brand credibility as among the reasons the partnership is a boon for not only his company, but for bitcoin and cryptocurrencies generally. But there’s little doubt the potential benefits could go both ways. As American Express competitors Visa and Mastercard each begin testing the waters with blockchain, the Abra partnership also signifies an industry-wide search for increased efficiency and speed that the technology could bring. But while both parties potentially stand to gain from the partnership, neither is depending exclusively on the other. In January, American Express joined blockchain consortium Hyperledger, which is exploring ways to capitalize on the technology without cryptocurrency at all. Further, Abra itself is excited about what the partnership could mean for blazing trails with other credit card companies, even even among it’s own bitcoin payments competitors. Disclosure: CoinDesk is a subsidiary of Digital Currency Group, which has an ownership stake in Abra.